ETNews reported on February 20, that vice chairman Lee who was recently released from prison was briefed on the current status of each business division. Regarding the TV business, vice chairman Lee was shown a declining business both from the panel making and the set making side. As shown in the following figure, Samsung’s TV shipments have declined in 2016, 2017 and are expected to drop in 2018. While Samsung remains the leader, they are being challenged by LG, with its OLED TVs and by the Chinese with there low cost models. Vice Chairman Lee, who once received quarterly briefings on the state of SDC’s OLED TV progress and eventually cancelled the effort due to the high cost of using LTPS/RGB and the potential embarrassment of shifting to RGBW, reportedly gave instructions to review restarting the OLED TV business. Lee's instructions were given for Samsung TVs, which are on a downward spiral. Samsung is still the strongest player in the world TV market, ranking first in the market for 11 consecutive years. But insiders report a real sense of crisis among employees at Samsung. Samsung enjoyed a market share of more than 50 percent in the premium TV market, its stronghold for a long time but now Samsung is behind Sony and LG Electronics rising with OLED TVs. Samsung recorded less than a 10% share in the most profitable TV market of US$ 2,500 or more expensive TVs in the fourth quarter of last year. The premium TV market is 'the way to survive' chosen by Korean TV companies in a price war with Chinese counterparts. Samsung played the lead role in developing OLEDs and has dominated the OLED smartphone business, but LG’s OLED TVs, which are now very thin, rollable and have outperformed all LCD TVs are dominating the $2,500 and greater TV market. Prices of OLED TVs, which are the most important factor in choosing TVs are on a gradual decline and due to OLED TVs, LG Electronics recorded the highest sales ever last year. 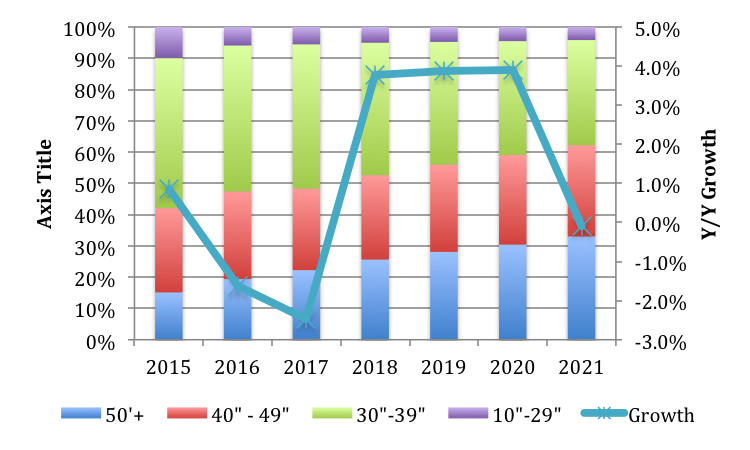 As the following chart shows, The Vice Chairman see a declining TV market, where most of the growth is coming from 50” and greater TVs, for which OLEDs have taken a dominant position in the upper end, which is most profitable. Samsung’s current line-up of “QLED TVs”, which are souped-up LCD TVs enhanced by quantum dot film, has largely been rejected in the market place. Samsung is now preparing to make a comeback to OLED TVs. One option is to use blue OLED pixels with “red and green color filter (CF) with quantum dot placed on the blue” OLED. This effectively means that the OLED pixels are enhanced by quantum dot, which could potentially improve brightness and colors compared to current OLED TVs. 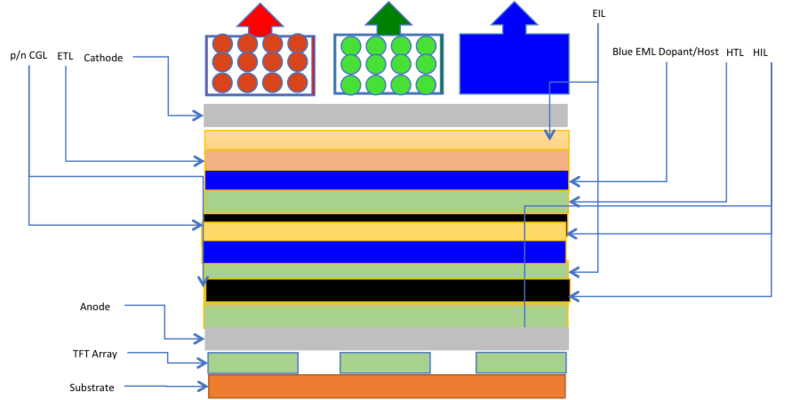 The difficulty with this approach is that the blue OLED is currently the weak link in the OLED family and would have to be enhanced with a second or third blue layer to produce sufficient lifetime. It is also not clear that the blue color can provide enough red producing photons. Below is an example of what the configuration might look like with a tandem blue OLED. Next month, Samsung will launch a new QLED TV model for this year and a huge investment is underway in research on the evolution of QLED TVs. Samsung showcased 55 and 65-inch QD-OLED TV prototypes in a private room during CES 2018, which we visited. However, ETNews stresses that the technology is not fully baked yet. The newspaper cites an unnamed Samsung executive as saying that the ultimately goal remains unchanged, which is to produce actual self-emitting QLED TVs. Until that happens, QD-OLED could move the goal post. “Samsung has not recognized OLED TV technology by competitors as a true OLED TV as it is using color filters and white pixels. The goal of QLED is to achieve QLED. It seems that as much time as it takes, we have tried to evolve QD-OLED into a new technology that takes advantage of the strengths of Quantum dot and compensates for its drawbacks” [translated]. The evolution of micro LEDs, a next-generation technology released some time ago, is also a variable. Another challenge is to avoid patent disputes by developing large-scale OLED panels through a different method. Samsung has been working with Kateeva and some soluble material suppliers to test the use of IJP. If they chose to use IJP, they would avoid the issue of “copying” LG and could use the expertise they gained in employing Kateeva’s IJP in TFE to take the lead over LG, CSOT and BOE who are all conducting R&D. Given the importance of the TV market to Samsung, they are going to look at all the new technologies, including OLEDs, electroluminescent QDs, and Micro LEDs. The issue with the latter two is that the timing is likely to be 5-years or more, before they can be used in a consumer TV. So unless Samsung can improve the performance of QLEDs, they may be forced to develop OLED TVs, in which case Samsung would have to revisit the issue of a Gen 10.5/11 fab as the only way to make 65” + OLED TVs that can compete with LCDs. The next chart shows the cost reduction of manufacturing a 65” panel on a Gen 10.5 vs. a Gen 8.5. The same type of cost reduction would accrue to OLED panels. IHS reported that panel makers produced 265.0m TV panels in 2017 and they also indicated that the industry shipped 216.7m TV sets, leading to an increase in the inventory of almost 50m panels or 23% of TVs shipped, which could indicate that even if TV set sales are flat, the number of panels will be down substantially. To further confuse the issue, Han Jong-hee, president of Samsung's Visual Display Business, told reporters after a forum in Seoul, “It is not true”, referring to Samsung’s adoption of OLEDs. The company announced during the Consumer Electronics Show (CES) that it will push ahead with the two-track strategy in its flagship TV business by adding its micro-level light-emitting diode (LED) lineup to its existing quantum dot LED (QLED) TVs. Han further said the company will start selling its latest MicroLED TV, dubbed the Wall, in August. To further discount the comments from Han Jong-hee, SDC purchased Kateeva's G8.5 IJP for pixel deposition. SDC says they purchased the platform to do research on IJP methods, although the results have been fairly negative up to now. It should be noted that Visual Display is a separate business from Samsung Display and doesn’t make decisions about what technology SDC will develop.